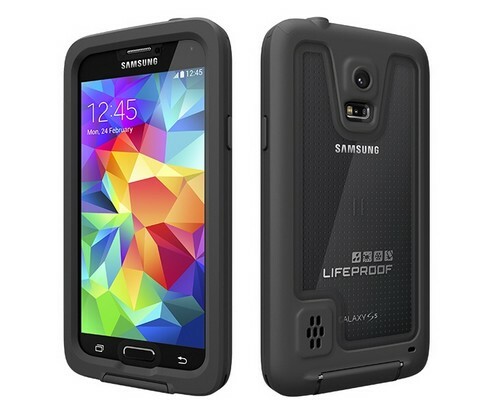 LifeProof frē for Galaxy S5 – The Waterproof & Shockproof Case. Take your Galaxy Anywhere on Earth. LifeProof fre gives GALAXY S 5 users the freedom to ride through rough terrain on a mountain bike, surf at the beach and hike remote mountains without their smartphone holding them back. The case provides IP68 protection for submersion in up to 6.6 feet of water for one hour and complete dust protection. While the GALAXY S 5 isn’t designed to take on drops and dings on its own, LifeProof fre passes military standards for shock and impact protection and can handle drops of up to 6.6 feet, taking the GALAXY S 5 to the next level for active lifestyles and leaving worry at home. LifeProof fre includes a built-in screen protector to help guard against display scratches without inhibiting touch screen functionality. The waterproof GALAXY S 5 case is designed to complement all device features and functions including heart rate monitor, fingerprint sensor speakers, volume controls, touch screen and cameras. LifeProof fre for GALAXY S 5 is now available in black and white for $79.99 on lifeproof.com and select retail locations. LifeProof takes your Galaxy S5 deeper, further, faster, higher. Sure, Samsung made the Galaxy S5 oops and accident proof. LifeProof makes your Galaxy S5 action and adventure proof! 15 mm thin. 46 grams light. LifeProof for Galaxy S5 barely adds to your phone’s size and weight. Yet it adds levels of protection, functionality and style not found in any other Galaxy S5 case on the planet. Launch your Galaxy to the four corners and back with the four proofs. Barrels in Malibu. Black diamonds in Banff. Moto-X in Ernée. Peaks in Patagonia. High-adventure in your hometown. frē for Galaxy S5 is your ticket to live life proof! Ultra thin and optically clear, the built-in touchscreen scratch protector is virtually invisible to your eye and your touch. And even though you won’t notice it, your touchscreen will thank you for it. Thin. Light. Tough. frē for Galaxy S5 is built to stringent military drop standards. And, it meets the highest international specs for water and dust ingress.